With all of the money your business spends on marketing to drive visitors to your website don’t you want to take advantage of every opportunity to improve your conversion rates and gather as much lead data as possible? PPC advertising is a great way to improve your marketing ROI, and if you are running an AdWords pay-per-click campaign you should really implement call tracking. Using AdWords call tracking allows you to gather additional information about your prospects. Call tracking allows you to see the phone number that initiated the call, the location it was placed from, the call duration, along with the recording of the call. Using this data allows you to see what geographical locations are responding well, and listening to the calls allows you to see what pitches are working, what ones are not, and what can be done to improve the closing rate. This is great to use for training your sales team. This is a great tool that can help you improve the effectiveness of your PPC campaign and increase the revenue generated. 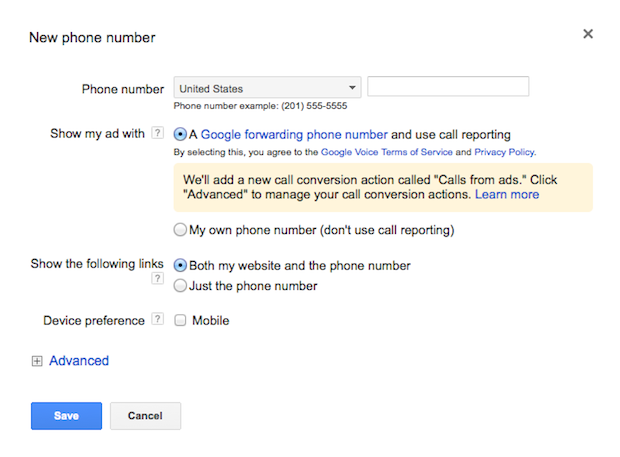 Want to know how your can improve your AdWords PPC with call tracking? Read below to find out. If you are currently running an AdWords PPC campaign then you most likely already have your target keywords selected and your ads already rolling. Many small business owners think that pay=per-click is not for them because their industry has a small search volume. This should not shy a company away from PPC, because that traffic can be extremely targeted. The number of searches a keyword receives should not discourage or steer you away from PPC. In fact, those keywords with low search volumes are typically very targeted and that traffic can be the highest quality. You want to make sure that your business is shown when someone searches for your products or services. Many consumers that click on your ads would prefer to call your business rather than complete an online form, and this is especially true for mobile users. They already have their phone in hand, so why not take advantage of this and encourage the call? This gives you a hot lead immediately on the other side of the phone that can potentially turn into a quick sale. AdWords call tracking is one way to help improve your campaign and make your marketing dollars go far. You can get tracking numbers that will forward to your regular phone number from third party vendors for a few dollars each a month or you can use Google Voice numbers for free. We suggest obtaining your own numbers and using a third party tracking platform. There are many affordable options that present you with a lot of valuable data that will help improve your campaigns. It is very simple to set up (see the screenshot below) and these numbers will now be shown next to your ads in the search results. It is important that you set up ad scheduling that is in sync with your office hours. For instance if you close at 5pm you don’t want calls coming in after that time when there is nobody available to answer. You can set it up so the number will not be visible when your location is closed or when you don’t want to take phone calls. Call tracking is a great way to test several variations of ad copy and find out what ones are producing the most phone calls. You can set up as many call tracking numbers and they will all forward to your main business line. The great thing about call tracking is all of the data it provides you with. You can look over your monthly reports and see how many calls each campaign generated, how long each call was, and how many calls were missed. You can also play back every call and listen to how your sales team performed on each call. This data gives you a very clear picture of the overall effectiveness of your PPC marketing. You can then dive deeper into your data and find out where the majority of your calls are coming from and where your sales are coming from. You can also pinpoint specific times of the day that generate the most calls and sales. The third party tracking software that is available on the market today is very good. We actually have our own custom AdWords call tracking software that we provide to all of our PPC clients. It provides us with an enormous amount of data that we use to keep improving the campaigns increasing the ROI. Using the data you will know what keywords and ad copy deliver the best results and you can also find out what members of your sales team are closing the highest percentage of deals. You can also take it a step further and determine if there are members of your team that close a particular type of client better and adjust your campaign to send specific ads/locations to specific sales team members. PPC can be very powerful when done correctly, and we often see many of our clients scale up their paid search once they see the kind of instant return it can deliver. While SEO and organic traffic is great, it can take some time to get it rolling, but PPC can deliver fast results and ROI. Paid search marketing and AdWords call tracking can produce the kind of data to help achieve amazing results and returns.